What if there were a way to help inmates gain a new purpose in life, while at the same time helping unwanted dogs prepare for a new lease on life? 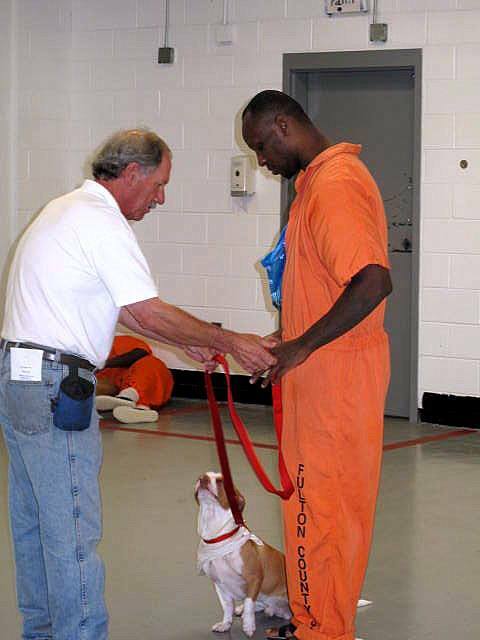 On June 4, 2013, a new program called Canine Cellmates debuted at the Fulton County Jail in Atlanta, Georgia. This program pairs shelter dogs with inmates serving sentences for non-violent crimes. The pilot program was completed on August 6th, and the results are impressive. Of the six dogs who completed the program, four have been adopted into loving homes, and all six dogs have earned their Canine Good Citizen status. Two of the inmates in this program have been released, and are now productive working members of the community. Canine Cellmates is the creation of Susan Jacobs-Meadows, who began the process with the Fulton County Sheriff’s Department in January of 2012. Susan waded tirelessly through the bureaucratic maze of the Fulton County government to make her dream a reality. According to Ms. Jacobs-Meadows, the procedures involved in working with Fulton County have been challenging. In anticipation of the second session, Susan Jacobs-Meadows says “We plan to make changes in the second session, but we are grateful, thankful, and extremely hopeful for the future prospects of this program”. Here’s how the program works: Dogs are selected from the Fulton County Animal Shelter, vetted, then transported to the Fulton County Jail Annex. Inmates have been pre-screened and are each paired with a dog. The inmates and dogs attend a 90 minute class once a day, seven days a week for the nine week session. Classes are taught by a Certified Dog Trainer with the help of one or more volunteer assistants. The lead trainers were carefully chosen, and only those who use purely positive training methods were asked to volunteer their time for this program. 1) It’s saved the lives of dogs in shelters who would otherwise be euthanized due to lack of space, trained them to have good manners, and helped adopt them into loving homes. 2) It gives the inmates a project that could potentially improve their lives. Being responsible for the care and well-being of an animal teaches responsibility. The inmates learn that training dogs with gentle methods results in happy, well-behaved dogs. They learn that great results can be obtained without the use of force or violence. Spending time in jail with a creature who loves unconditionally has a calming effect on the individuals who likely encounter significant frustration daily. 3) It provides the community with more responsible citizens who re-enter society with a marketable skill. Statistics show similar programs have reduced recidivism rates, thus making each community a safer place to live. In addition, the families who adopt these dogs have saved a life, and are rewarded with unconditional love from a dog who is also more prepared to live in our human world. Finally, Fulton County has a wonderful opportunity with this type of program to create positive media attention. As one of the lead trainers in this nine-week program, I had the good fortune to witness a measure of growth and transformation in all of the inmates and dogs who completed the program. Somewhere around week five, I noticed that several of the inmates began teaching more cues to their dogs than just those listed in the curriculum. They were teaching cute tricks, like “get your leash”, and catch the ball in air, and bark once, twice or three times. A representative of the Fulton County Sheriff’s Department is present during each class. I’ve noticed more than a passing interest bya few of the guards, and have answered a few questions about a dog’s behavior for one of them after class. About a week ago, Ms. Jacobs-Meadows and I were chatting after class with Sesar, one of the inmates who showed remarkable training skills during session one. Sesar confided in us that during the first couple of weeks in training, he and the other inmates thought that the program was doomed to fail. Sesar told us that he and the others thought we were “crazy” and were never going to teach the dogs how to behave using the methods we employed. (Treats, toys and play?) He thought using treats and positive reinforcement was a waste of time and that the dogs would never pass their CGC test. He added, “it wasn’t long before we saw how well it worked, and we now realize this is the best way to train all dogs. We were surprised with how well the dogs responded”. (https://www.facebook.com/CanineCellMates) The main picture on Seasar’s Facebook page is of him and Beau, his first dog who has been adopted and is now living happily with a loving family in Sandy Springs, Georgia. We are hoping that, by learning to train dogs with compassion and positive reinforcement, these inmates will begin to transfer this approach to the way they deal with human beings as well. The second session is now underway, and promises to be better than the first. Sesar and Mario are seasoned handlers/trainers, and are helping to initiate the four new inmates who have been selected to join the program. Having the support and enthusiasm from Mario and Sesar, two inmates who have proven that training dogs without force or coercion, means the world to Susan Jacobs-Meadows and the trainers. This program is truly making a difference in the lives of these men, and likely in the lives of future inmates, and especially in the lives of many shelter dogs. The Canine Cellmates program is not the first of its kind. Similar programs within the prison system have been operating around the country for some time. Statistics from these programs can boast significantly lower rates of inmate recidivism in their communities. A large percentage of dogs relinquished to shelters each year had received no training whatsoever. This program aims to change that, little by little.